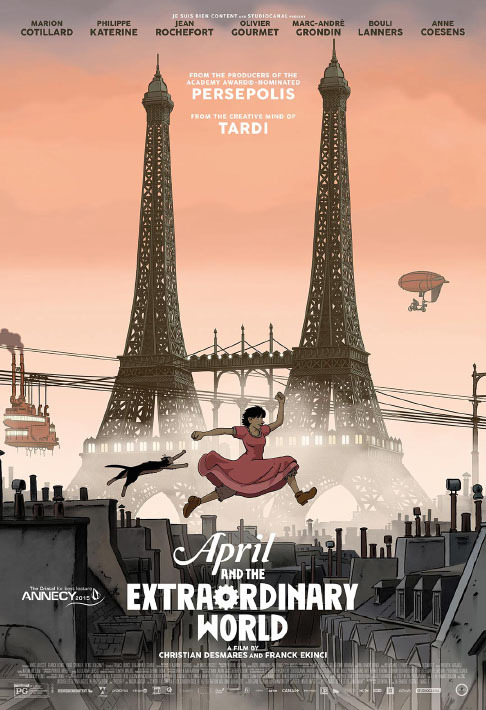 April and the Extraordinary World [trailer] is the English dub of a 2015 French animated film, originally titled Avril et le monde truqué. There was a limited North American theatrical release in April 2016. Furry-wise, it's borderline: a likeable talking cat sidekick, plus a little extra anthropomorphism that I can't discuss without spoiling. Its main appeal is for steampunk fans. If that's your thing, it's definitely worth a look! The film is set in an alternative history in which France never went to war with Prussia in 1870 (a precursor to WWI). Over the next 60 years, scientists all over the world mysteriously disappear, so technological progress is minimal: no electricity, radio, airplanes, etc. It's an age of steam, and after the coal mines are depleted, forests are razed to turn trees into charcoal. By the 1930s, the energy crisis leads Europe to war with North America. Any remaining scientists are scooped up by the government to aid in the war effort, and the police actively seek out those who have gone into hiding. 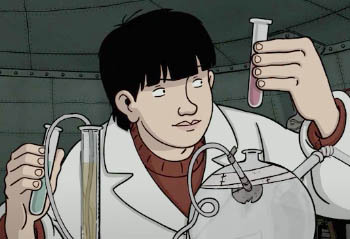 The story starts with a family of experimental chemists. In 1870, Gustave Franklin is commissioned by Napoleon III to create a serum that will make his soldiers invulnerable. It fails, but Franklin's son, grandson and his wife continue his research, hoping to make humanity free of disease and aging. They don't entirely succeed either, although they manage to give the power of speech to a cat, whom they name Darwin. Darwin belongs to their young daughter, April. Just as they're about to test the latest version of the serum, a police raid happens. The family is split apart and loses all contact with one another. Years pass. April, who managed to escape from police custody, is now a young woman. She lives a clandestine life, stealing what she needs to survive and continue her family's research. Darwin is her only friend and companion, and he's ill from the soot-choked air, so she's more determined than ever to complete the formula in order to cure him. What she doesn't know is that the police officer who originally led the raid against her family was demoted, and is obsessed with finding her. He's hired a young delinquent named Julius to track her down. If this sounds spoileriffic, it's not; there's a lot of exposition and plot set-up in the first part of the film. For the rest - not saying! It's a fun steampunk romp, with good dramatic tension and some extra surprises along the way. You're going to need a hefty suspension of scientific disbelief for parts of it. 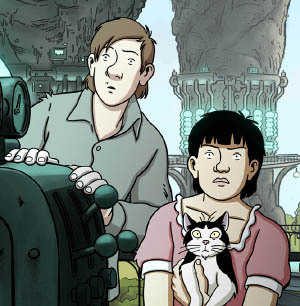 Not just for the steampunk genre, which is more about visual style than practical machinery. The potential social implications of the serum are never explored, the destroyed ecology doesn't seem to have resulted in mass starvation, and so on. Take it for granted; enjoy the adventure and you'll be fine. Still, be warned that there's a heavy-handed environmental message: Look at a world without trees! Luckily this doesn't dominate the narrative, and there's humor mixed in too. I laughed out loud at Alexander Fleming's cameo. I haven't seen the English dub, so I can't comment on that, but the visuals are very high-quality. 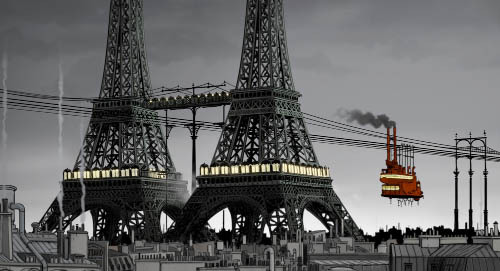 Most North American viewers won't know it, but the film's entire design is an homage to a French comic book artist named Jacques Tardi, and wow, they nailed his style. It fits the story perfectly. Character-wise, everyone's motivations are pretty understandable. There are a couple of male-female pairings in the film where the two people have made difficult ethical choices, and don't see eye-to-eye on everything. April is a fairly strong female protagonist, although she still gets a few feminine clichés. She's saddled with two sidekicks - her talking cat (who's got a great attitude), and Julius the police spy. Surprisingly, both of them turn out to be about equally useful. Julius betrays her, of course, but later comes around to her side, and his actions inadvertently propel everyone into the final act of the story. Aside from questioning the scientific silliness, I enjoyed this film start to finish. 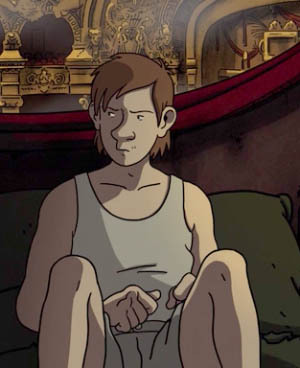 The characters, the dialogue (in French), the story and pacing, and the overall design. I hope the English dub does it justice! So far I've only been able to find a pirated French copy, and an English subtitle file that isn't too good. Once this comes out on DVD in English, I am definitely buying a legit copy. That might be as soon as August 2016. So yes, it's marginally furry, and I give it a thumbs-up for lovers of the steampunk genre, and for anyone who likes animated films! 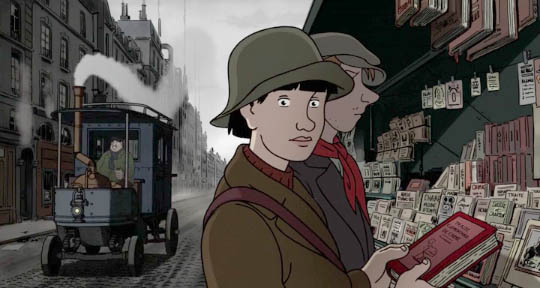 The North American distributor is GKids, who aren't a high-budget outfit, but if you like animation, they're devoted to importing foreign animation and making it accessible to North American audiences. It's worth checking in on them two or three times a year to see what they've got coming in; there's often something new to discover. (I'm curious to see Kahlil Gibran's The Prophet and Phantom Boy). When the DVD becomes available, I'll add a link below. I'm keeping an eye out for this film. Don't wait for the DVD! Here's a link. DVD update! The DVD and Blu-Ray discs in the U.S. became available in early August 2016, distributed by Universal. (Available on Amazon). It has the original French audio and the English dub, which I haven't heard yet, plus subtitles in English and French. The Canadian DVD and Blu-Ray discs are from Mongrel Media. They also do business as Metropole Films in Quebec, where they sell the film under its original French title - the packaging is French but the disc is essentially identical in content. (Amazon page). The DVD has the original French audio and the English dub - but no English subtitles. I have no idea what the Blu-Ray release has on it, subtitle-wise, but I am not filled with confidence. So I've paid extra shipping to get a copy of the U.S. DVD, and will give my feedback on the English dub and subtitling once I have the chance! 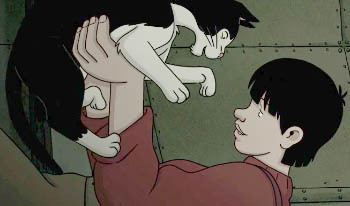 There is indeed more anthropomorphism in this animated film than the cat sidekick, but discussing it would be to spoil a good chunk of the plot. I don't know if any of the online streaming services carry the film (Hulu, Netflix, etc). My sister got the U.S. Blu-Ray, and I watched it last weekend. I'm totally happy with it! Darwin the talking cat would make it worth watching by furry fans by himself; and yes, there is considerably more important anthropomorphism that's not even hinted at in the trailer. 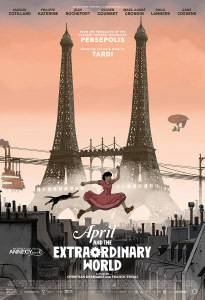 Plus the story is a very good alternate-history/steampunk s-f plot, and French cartoonist Jacques Tardi's art style is excellently suited to the story. A recommendation: Watch it with the English dialogue track plus the English subtitles. They're not identical. You can see/hear where the voice actors took little liberties with the written script. Both are fine, and the little differences let you see both. One little difference that doesn't come through in the translation: in the French version, April's last name and her scientist parents' name is Franken -- a nod to Shelley's Dr. Frankenstein, who was also a scientist, not a monster. In the English version, it's Franklin -- a nod to Benjamin Franklin, who was also an important scientist and inventor of his time. I've gotten the American DVD release, and the English dubbed version is very good! Like Fred mentioned, the subtitles and the dubbing are not identical - in fact they're vastly different with wording. The meaning comes through either way; they just chose different words to express it. I always thought the "cure for aging" is such a dumb idea. Want to have children? TOO BAD! And living forever will drive your monkey brain insane.